This is a face-to-face playtest session of the campaign. (Using the playtest map; some parts, in particular the woods around the river, are a bit more refined in the final version.) The first photo shows the setup. 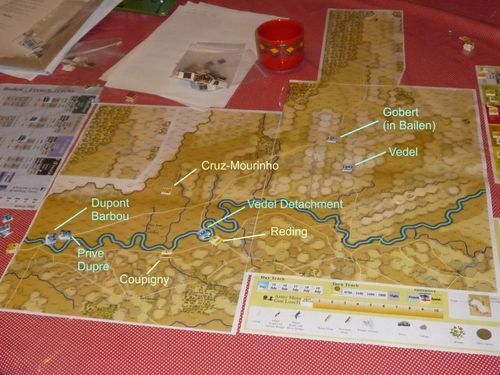 Dupont only reacts when he realises that an unidentified force which must be Cruz-Mourinho's guerilla force is coming down from the Sierra Mestanza and crossing the main road to cut off the brigade at the river bend. He sends Prive's and Dupre's cavalry brigades racing up the road with an ATTACK order to try and cut off Cruz-Mourinho before the brigade is attacked. However, Prive and Dupre come too late. Cruz-Mourinho attacks the French brigade. Although the French fight back defiantly, they are eliminated. However Cruz-Mourinho's guerillas take fearsome losses as well and the rest disperse into the woods. 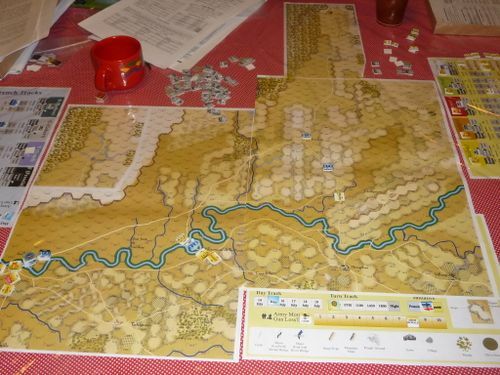 With the French infantry gone, Coupigny crosses the river. 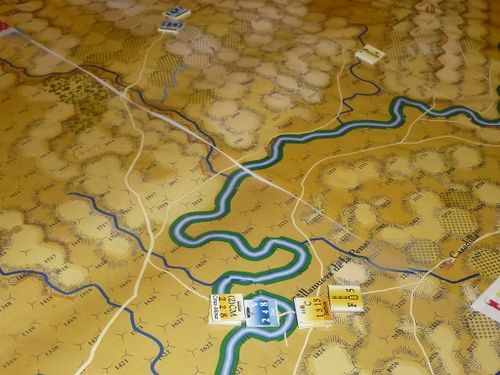 As Dupre's and Prive's cavalry arrives, they find Coupigny's division arrayed in front of the river, and as befits their orders, they charge! Coupigny's men in fact fail to all form square cleanly, but this still does not help. 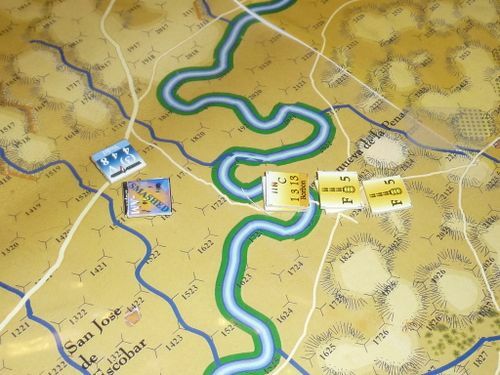 Though there is some disorder in the Spanish ranks, numbers and the Spanish cavalry tell and Dupre's brigade is eliminated. Prive's brigade suffers some straggler losses and retreats in Smashed status. For a moment it looks as if by his belated response, Dupont has thrown away all his cavalry on the first day of the campaign. 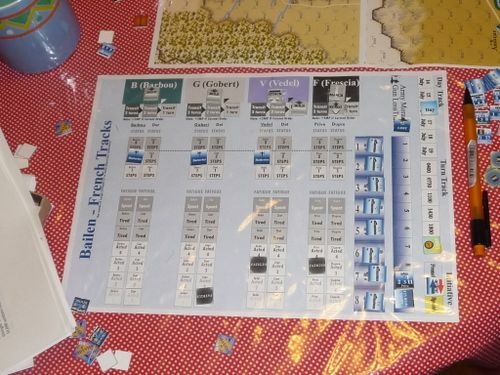 Vedel's division marches up, potentially available to screen Prive, but it turns out that the Spaniards are not advancing further, and Prive's unit can withdraw towards Andujar. To the east, however, Reding's strong division is now demonstrating in a quite menacing fashion towards Bailen. Night falls before anything happens in that sector though. Dupont breathes a sigh of relief as Prive's cavalry reforms. Vedel's division arrives at Andujar in the morning of July 15. July 15: In early morning, a courier arrives from Bailen, telling that Gobert, holding the town, is in a near panic since Reding obviously means business and is arraying his troops for battle. He will attempt to take the town and cut the French lifeline to Madrid! Dupont reacts by sending Vedel's division on the road again, to relieve Bailen. Long before Vedel can arrive there though, Reding is already assaulting Bailen. 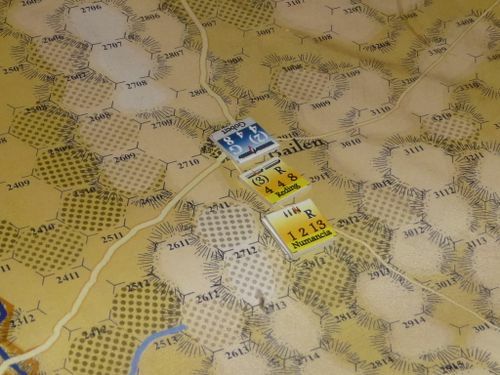 However, while Gobert's weaker force would not be able to withstand Reding in a field battle, it is well ensconced in the town and Reding's attack is bloodily repulsed. Undaunted, Reding tries again. However, he again rolls badly and stays outside the town. 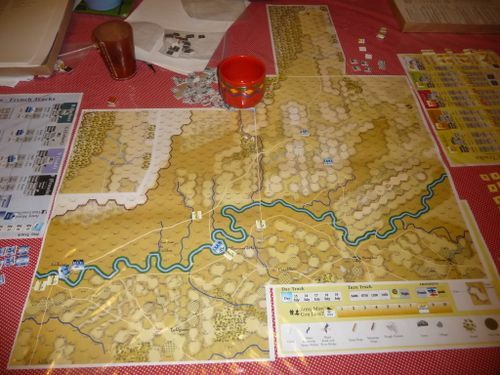 Reding has now realised that this is not going to be the walkover he expected, and sends orders to Coupigny to join him at Bailen. However, Coupigny is still at the river crossing, 10 miles away as the crow flies, and half again as far by road. He will take till the next morning to arrive. 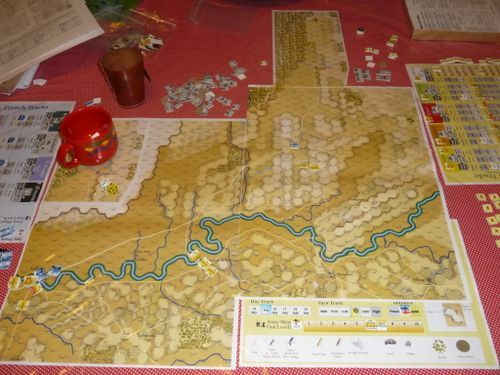 Shortly before evening, Vedel's division arrives on the hills south of town, threatening Reding's flank. He is too weak to attack Reding though. Night falls before Reding can recover from his disruption and no further attack occurs. 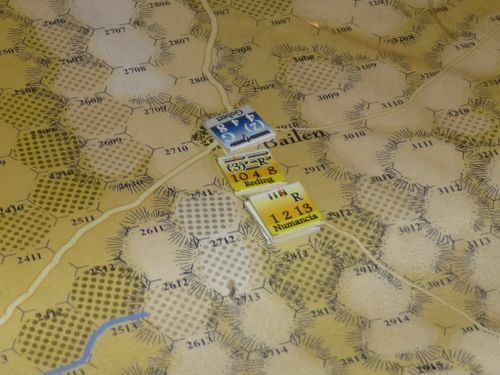 On the morning of the 16th: Reding attacks Vedel's division south of Bailen, but fails again, since Gobert has detached a brigade to reinforce the position on the hill. Reding's division is down to 40% of its original strength due to combat and straggler losses, but is finally joined by Coupigny's division. 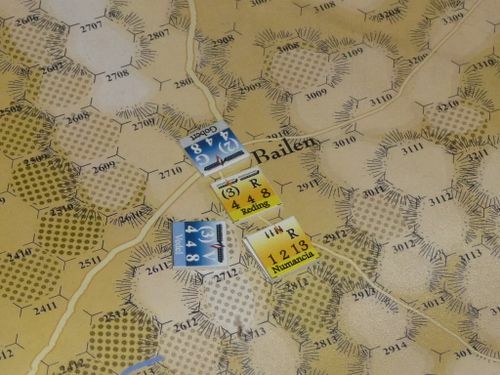 Before the Spanish attack again, Gobert's detached brigade repositions off the hill towards Bailen to be able to slip into the town if it should need to retreat. At this point, the Spanish player conceded. 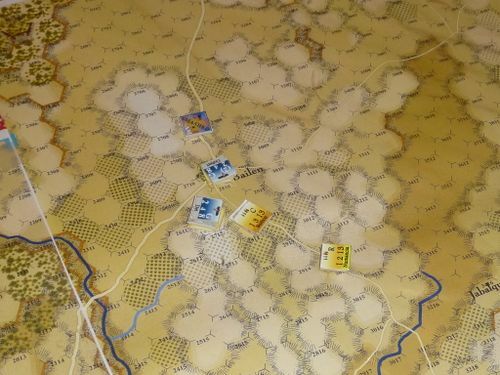 With his right wing out of supply and no troops close to protect the remaining supply wagons, the Spanish position is threatened in the extreme. (Being out of supply slows down recovery of fatigue, prevents attacks, and weakens on the defence.) 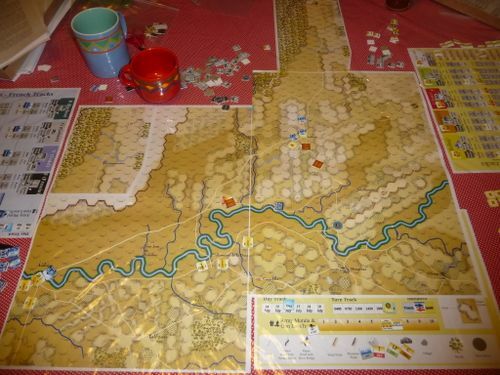 The natural response would be to pull Reding and Coupigny back, which would mean they cannot interfere when the wagon train appears on the 17th. The Spaniards shot their bolt too early. Total time to explain the rules, set up and play: about 2.5 hours. Final photos: The French and Spanish record tracks at the end. Note particularly the completely Spent status of Reding's division and cavalry (leftmost Spanish tracks). They can barely move for fatigue at this point. 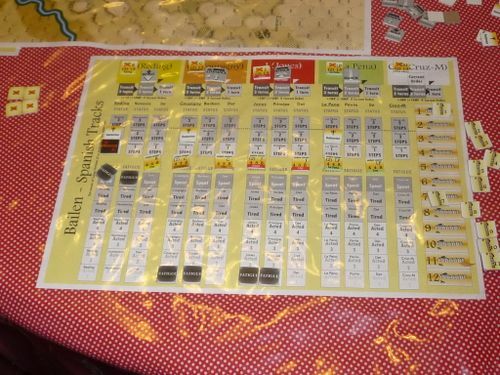 Note that at this point the game can be played with roster sheets instead of the tracks, or for those who disdain tracking individual unit stats, with the MiB "Lite" rules.